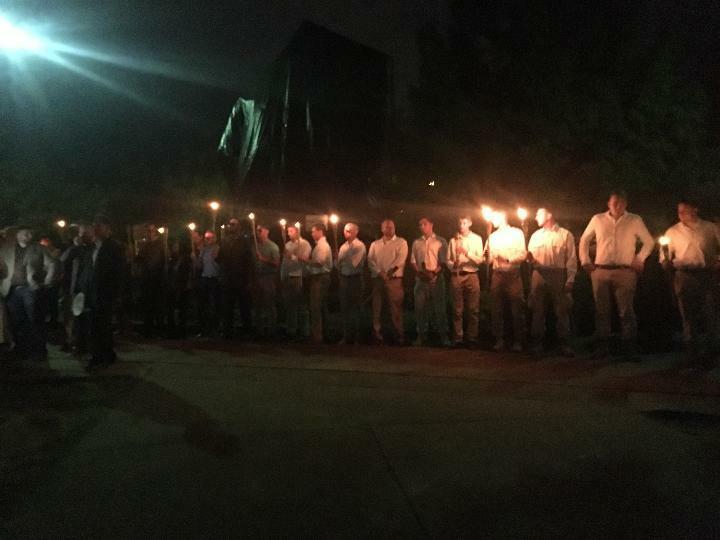 A group of white nationalists held a torch-lit rally in downtown Charlottesville Saturday night two months after clashes in the city led to the death of a woman who was struck by a car. CBS affiliate WCAV-TV reports that "alt-right" activist Richard Spencer and others carrying tiki torches gathered at Emancipation Park near a covered statue of Confederate Gen. Robert E. Lee. The fate of the statue depends on a legal challenge after a court recently blocked its removal. The marchers were heard chanting "you will not replace us," and "we will be back," WCAV-TV reports. The rally dispersed after about 20 minutes. Many credit Spencer with popularizing the term "alt-right" as he garnered national media attention after being heard shouting "Hail Trump!" at a white nationalist convention in Washington, D.C., and later, being punched in the face on Inauguration Day while giving an interview. WCAV-TV reports that the Charlottesville Police Department said they are conferring with the Charlottesville Commonwealth Attorney's office to determine if any legal action will be taken in response to the rally. Last month, protesters defending Confederate statues surrounded the Robert E. Lee monument, but counter-protesters far outnumbered them, forming a crowd of several hundred people. In August, Heather Heyer, a 32-year-old, was killed when a vehicle slammed into counter-protesters after a demonstration by white nationalists, neo-Nazis and Ku Klux Klan members in Charlottesville. Nineteen people were hospitalized.